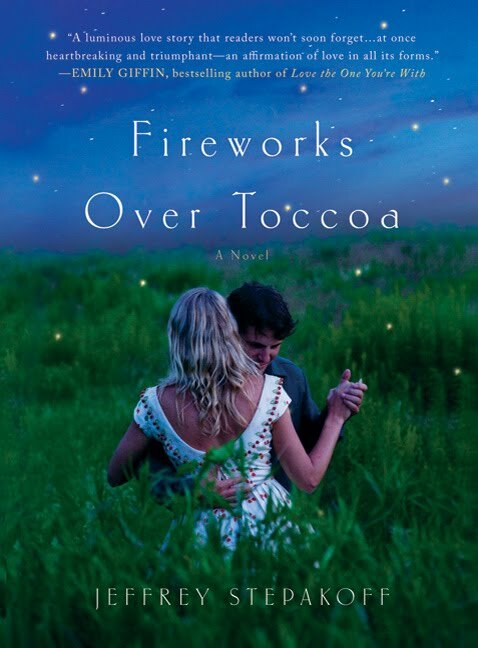 Book Review :: Fireworks Over Toccoa … and a Giveaway! Jeffrey Stepakoff’s Fireworks over Toccoa has all the passion of The Bridges of Madison County with the nostalgic longing of Titanic. And, I believe the story in Fireworks is compelling enough that if it is adapted and cast well, it could have similar success. While Fireworks is his first novel, Stepakoff is very familiar with writing for drama. With a writing resume with the likes of Wonder Years, Dawson’s Creek and Sisters (a personal favorite), it is hard to read this love story without imagining it on a screen. Fireworks over Toccoa is the story of Lily Davis Woodward – a young girl who has been married for over three years, but because of WWII, has only spent two weeks of that with her husband. Now, as her hometown is getting ready to welcome back the local soldiers, Lily is unsure that she’s ready to proceed with life as Mrs. Paul Woodward. At the same time, Jake Russo, an Italian-American pyrotechnics specialist, has come to town, having been hired to pull off a spectacular 4th of July fireworks display. When Lily meets Jake, she catches a glimpse of what life outside of her small town might offer. Beginning and ending in (almost) present day, Fireworks is a reminder of how quickly a simple object can transport the mind and spirit to an earlier time. On a personal note, as a Toccoa native, reading Fireworks over Toccoa was a treat. Stepakoff researched my small town well, and I loved reading the fact, fiction and folklore of where I grew up. This isn’t the first time Toccoa has made it to the map. Toccoa became a household locale a few years ago when HBO’s Band of Brothers became popular, as “Easy” Company was among the many airborne divisions to train at Camp Toccoa. I had the privilege of attending a Stepakoff reading at the Train Depot in February. I’m always interested to hear how writers write. And since Stepakoff also teaches creative writing, I was even more curious. He described the writing process like a map that takes you from one river bank to the other. He advises his students to have enough of the milestones set that you know where you’re going, but not so many details as you don’t enjoy discovery during the journey. As you sit down to enjoy Fireworks, be prepared for Stepakoff’s journey, and the fact that you won’t want to get up until you’re finished. Fireworks over Toccoa is set to be released March 30. I was graciously provided an advanced reading copy of Fireworks over Toccoa by St. Martin’s Press at the request of the author. Now for the fun! I have a copy of Fireworks over Toccoa signed by Jeffrey Stepakoff for one lucky reader! To enter the contest, leave a comment below (be sure to include an email address if your profile doesn’t have one). *To double your chances of winning, become a fan of Babbette’s Book Blog on Facebook. **To triple your chances, blog this giveaway on your site. This contest will run until April 20. Good luck to all! 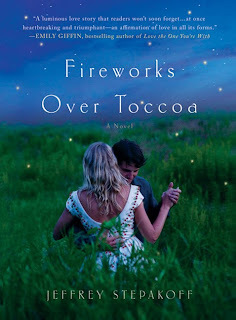 Posted in Book ReviewsTagged Book Reviewscomment42 Comments on Book Review :: Fireworks Over Toccoa … and a Giveaway! Share your best April Fool’s jokes! Now a fan on facebook too! Edna & T4M – You're entered! Thanks! How exciting to know that the author was able to capture your hometown. It's not easy to please natives when one is writing about a town (nor should it be easy – an author should do plenty of homework! ), so it's always satisfying to learn when an author does it successfully. I would love to read this book, please count me in. You're in – Bunny, Bill, Misti, JanetRuth & FionaChan! Thanks! Fabulous book and the author & is wife are great! Pick me, pick me!! This sounds like a fun read. I would love to read this story. Thanks. Tiff, Shannon & SandraK – you're in. Thanks! Not that I judge a book by it's cover or anything,but I love the book cover! It's one of the best I have seen in recent times! The story seems awesome. So please enter me for the giveaway! I hope I win! Please Please please!!! Please enter me. I'm a fan. Oh, I would so love to win a copy of this book! I love any and all stories that take place during the 1940's. This book sounds so good. I would like to read it. Thanks for the chance. New folks entered include Amanda, Bookaholic, Paromita, Kelly & Mia! Keep 'em rollin' in – still 19 days! Oh I can't wait to read this! Enter me! I really want to read this book. Thanks. degood, Heather & Sandra – you are all in! I would love to read this. Please add my name to the drawing. Deedles & Francine – you're in! I would love to read this—please enter me to win! I would love a chance to win and April 20th is Fiance's Birthday so maybe I'll win something on HIS birthday!! skkorman & Heather M. – you're in! Renee – thank you for visiting & for your kind words. And, you're in! Good Luck! I love the cover of this book! And it sounds really nice! Liz & Aik – You're both in… I'll be drawing tomorrow!! !